STEVIE WONDER TICKETS OFFICIAL PACKAGES - ON SALE NOW! 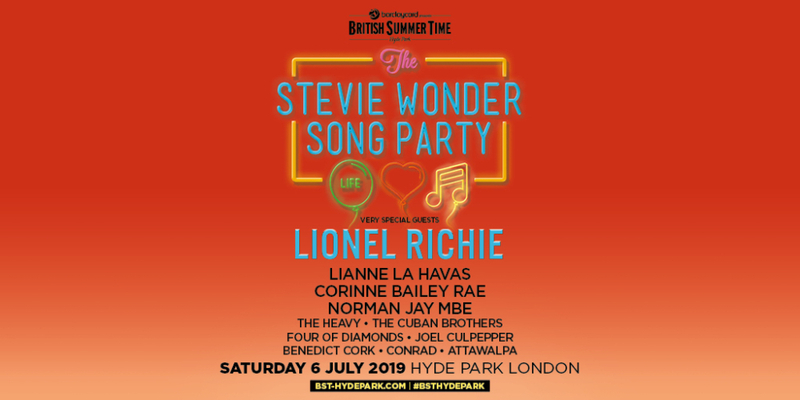 Singer, songwriter, musician, and producer Stevie Wonder announces “The Stevie Wonder Song Party: A Celebration of Life, Love & Music”, with very special guest Lionel Richie, in concert at Hyde Park Saturday 6th of July, 2019. This will be a must see show this summer in this wonderful setting and two iconic artists! + many more artists to be announced..
To enhance the enjoyment of this special day you can also choose from a range of Official Ticket Experiences including a Ticket or VIP Ticket and Overnight Hotel Stay in the city! Or check-out the Exclusive ** ULTIMATE BAR EXPERIENCE ** including choice of Barclaycard VIP Summer Garden Tickets, with access to GOLD CIRCLE STANDING or of course the option of the DIAMOND CIRCLE, to be right in front of the Great Oak stage! - Arrive to a Welcome Glass of Fizz, Complimentary Bar, Comfortable occasional Seating, (The Ultimate Bar is an Exclusive Area restricted to The Ultimate Bar Pass Holders Only) The Ultimate Bar opens @ 12:00pm (TBC) - Public Doors 1:00pm - Whatever you are looking for, British Summer Time will provide all the ingredients to enjoy your day in London's Hyde Park, with an incredible line-up of Artists and music! Stevie Wonder BST Ticket and Hotel options include a choice Primary Entry (early entry), Gold Circle, Barclaycard VIP Summer Garden, Diamond Circle and The Terrace tickets and a comfortable night in the UK's famous capital city - Extra night stays are also available. NB: Summer Garden, the Terrace and Diamond Circle tickets all have full access to the VIP Summer Garden and Main Public areas to enjoy throughout the day. Provisional Times - Gates Open: 13:30H – please note the gates will be open approx. 60 minutes early for those customers who select Primary Entry, Gold Circle, Barclaycard VIP Summer Garden, Diamond Circle, The Terrace and *The Ultimate Bar * Opens @ 12:30H or arrive at your leisure - Age restrictions - Anyone under 16 must be accompanied by a parent or guardian (18 or over) - Disabled Access - All tickets are available via the festival website or AXS.com. There is a Wheelchair platform and an Ambulant area. All tickets come with 1 free personal assistant. We regret that special access tickets are only bookable via the BST website. exclusive DIAMOND CIRCLE (Premium Standing Area, directly in-front of the Great Oak Stage!) both sections allowing you to leave and return as you wish!